Place bananas cut-side down on a clean cooking grate over direct low heat. Cook for 2 minutes or until grill marks appear. Using a pair of long-handled tongs, turn over and let cook 2 more minutes or until the skin pulls away from the banana. Be careful not to burn the bananas. Peel the bananas and reserve. Add in half and half to frying pan and whisk until thickened, about 2 to 3 minutes. Remove from heat and add chocolate and whisk until completely melted. 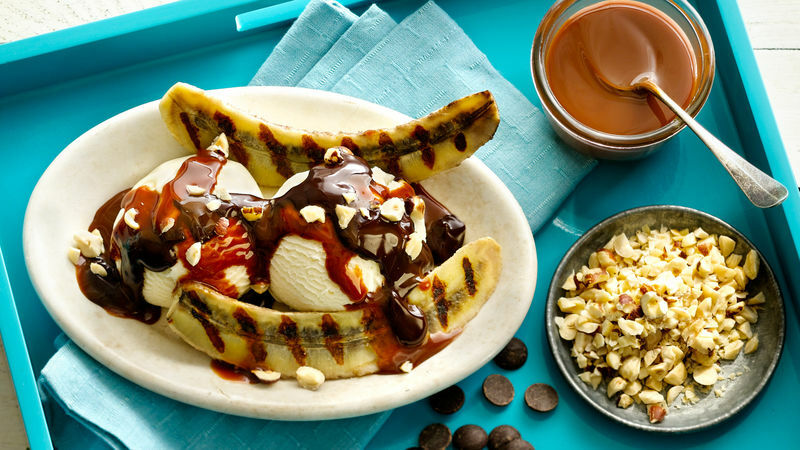 Serve vanilla ice cream between two bananas halves and top with chocolate sauce, hazelnuts and drizzle with cajeta. Serve extra chocolate sauce on the side if desired. Have you ever tried grilled bananas? They are amazing! If you add crunchy hazelnuts and dulce de leche… it is even better!